As the degree o the Taylor polynomial rises, it approaches the correct function. 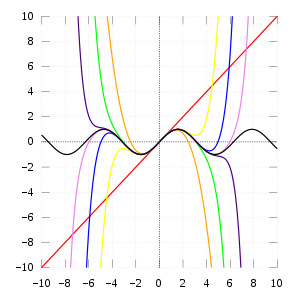 This image shaws sin(x) an its Taylor approximations, polynomials o degree 1, 3, 5, 7, 9, 11 an 13. The exponential function ex (in blue), an the sum o the first n+1 terms o its Taylor series at 0 (in reid). In mathematics, a Taylor series is a representation o a function as an infinite sum o terms that are calculatit frae the values o the function's derivatives at a single pynt. The concept o a Taylor series wis formulatit bi the Scots mathematician James Gregory an formally introduced bi the Inglis mathematician Brook Taylor in 1715. If the Taylor series is centred at zero, then that series is an aa cried a Maclaurin series, named after the Scots mathematician Colin Maclaurin, wha made extensive use o this special case o Taylor series in the 18t century. This page wis last eeditit on 4 August 2016, at 22:25.